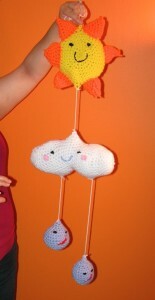 A few weeks ago, I bought this irresistible mobile pattern from Amy Gaines‘s Etsy shop. At the time, I was wrestling with my first crocheted scarf and thought this mobile would be light years away from getting made. I was almost right. I got the hang of the single crochet, but increasing and crocheting in the round were making me very cranky. All my books, Google, and YouTube were doing nothing to help me figure out the situation, and I was ready to abandon crochet entirely. After feeling the deadline pressure with the Crete Quilt (on the backburner until Ian’s actual birthday in August…or maybe Christmas) and now this, my crafty mojo was low. Nonexistent. Sure, I’ve been cooking up a brilliant storm in the kitchen. But crafty librarians cannot live on culinary skills alone. Then I had a breakthrough. I finally found a decent picture of increasing in an Amigurumi book, and it all clicked. Then I figured out a way to start in the round that made sense to me. Then I couldn’t stop myself. And a week later, I’ve finished this mobile. It’s very rough around the edges, but what can you expect from my first attempt at a non-scarf crocheted item? There are definitely mistakes, but that’s what I pass off as “made with love.” And it’s finished in time to give to my baby niece at tomorrow’s family cookout. My mojo levels are replete with splenditude! That’s right, I said splenditude. UPDATE: I did bring this mobile to give to my 15-month-old niece at today’s cookout. I think it was a hit. After my niece fell down in some dirt and started to cry, I pulled out the mobile to see if I could get a smile. She stopped crying and reached her dirt covered arms out to grab at all the dangling things. Triumph!